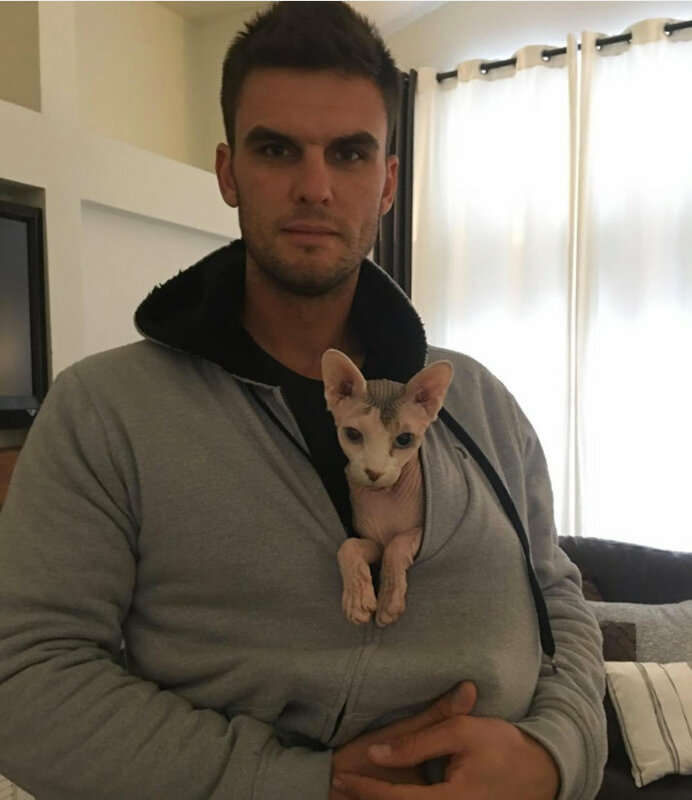 Greg Bird with Mr. Delicious. TAMPA, Fla. — For more than four decades, the Yankees’ lineup has almost always included a first baseman with left-handed power. Think of Chris Chambliss, Don Mattingly, Tino Martinez, Jason Giambi and Mark Teixeira. Chances are you picture a lot of home runs clearing the inviting right-field wall in the Bronx. Now think of Greg Bird. Manager Joe Girardi confirmed the other day that Bird, another left-handed hitter, had won the starting job at first base. 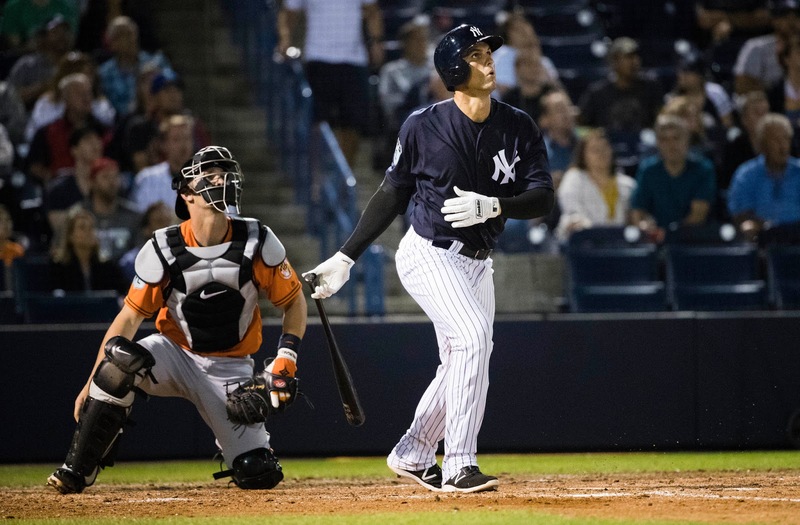 It was Girardi’s easiest decision of spring training: Through Friday, Bird had six home runs, plus a .432 batting average. In time, that slugging could become synonymous with Bird, as it was for his predecessors. For now, though, a fun factoid might stand out most: Bird owns a hairless cat who descends directly from Mr. Bigglesworth, the feline friend of Dr. Evil in the movie “Austin Powers: International Man of Mystery,” a 1997 comedy starring Mike Myers. O.K., so maybe we’re giving in here to the — sorry — dog days of spring training, which is longer than usual this year because of the World Baseball Classic. But as offbeat baseball trivia goes, it is pretty irresistible. Bird posted a photograph of the cat, Mr. Delicious, on Instagram before spring training and discussed him with the YES Network last week. Bird certainly belongs in the company of Toronto pitcher Mat Latos, who owns a cat named Cat Latos, and Tampa Bay infielder Matt Duffy, whose 30-pound cat, Skeeter, is an internet star. Bird, 24, played 46 games for the Yankees in 2015, hitting .261 with 11 home runs. But he missed all of last season after undergoing labrum surgery on his right shoulder in February. A family friend from Colorado, Kelly Westover, breeds cats, and she had tried for years to persuade Bird to adopt Mr. Delicious, who is about 8 years old. Bird was skeptical. Bird acknowledged that petting Mr. Delicious, who had his name before Bird got him, is an odd sensation. Some friends do not see the appeal right away. Not exactly, said shortstop Tyler Wade, who does not like touching the cat. But Wade conceded that Mr. Delicious had a winning — and amusing — personality. To recap: This is a Bird whose cat acts like a dog but has no hair, just like his famous ancestor. When the Yankees break camp, Mr. Delicious will go back to Colorado to spend the baseball season with Westover and a few other cats. But he belongs to Bird, and Bird to him. Cat ownership was not the only benefit of Bird’s lost season. The injury had been building throughout 2015, and now he is healthy — and mentally tougher, he believes, from completing the long rehabilitation. 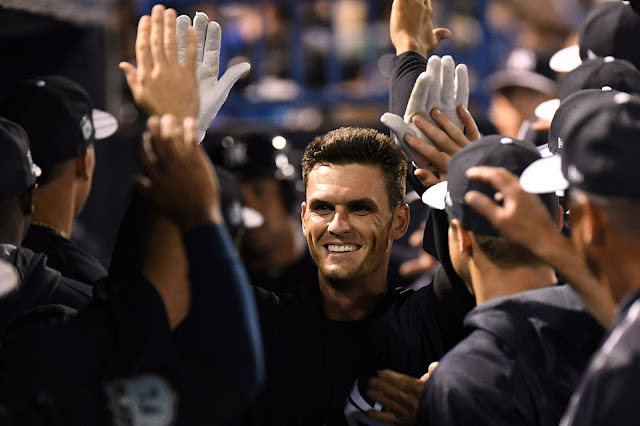 Bird returned to play in the Arizona Fall League, hitting just .215, with one homer, but he has found his swing in Florida. Alan Cockrell, the Yankees’ hitting coach, said Bird’s uncomplicated mechanics had helped. Bird’s power should play well at Yankee Stadium, as it has for left-handed sluggers since Babe Ruth. As a boy in Colorado, Bird learned about Ruth from a television special and the movie “The Sandlot.” He wore No. 3 in Ruth’s honor, and when that number was unavailable in high school, Bird switched to 33, which he wears now. Add that nugget to the quirky mystique of the new Yankees first baseman. He is a Bird who wears No. 33, not for Larry — a Boston sports legend — but for Ruth, a Boston star who became the greatest Yankee of all. These Yankees, of course, are unlikely to dominate as Ruth’s teams once did. But as they make their most sincere commitment to young players in decades, the Yankees have enjoyed spring training, going 20-7 through Friday. Maybe, if Bird keeps hitting this way, they can make his hairless cat their mascot.